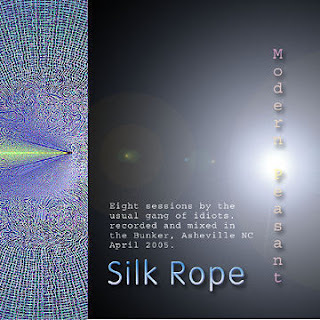 Comment: by listening to the album Silk Rope by the artist Modern Peasant I guess it evokes many thoughts within the listener’s head. First of all, it chimes as a modern equivalent of the so-called American Primitivism movement, being established and popularised foremost by such artists as John Fahey, Robbie Basho, and Leo Kottke. Musically it does mean it is filled with warped and extended guitar chords as if they were played on the prepared, vibrant instrument. As I already denoted the album to be a modern equivalent of the style the first part of it hints at intriguing electronic sounds, arousing sonic effects and some suggestive noises within it. However, the artist must be praised due to having the inner measure line in itself to balance these compartments in a moderate way. Because of the aforementioned contemporary part within the artist`s music Silk Rope could be pigeonholed as an exemplary of the New Weird (America) movement, for instance, having much in common with Ben Chasny’s Six Organs Of Admittance, and the French experimental folk duo Natural Snow Buildings` droning landscapes full of beatific magic. In a word, the result is enchanting providing fare to your soul and heart. Initially this 8-track issue was released on an Asheville, NC-based netlabel, Epicaricacy, what at the moment is very hard if not impossible to dig up. The issue truly deserves to be disseminated through thousands of headphones and loudspeakers over the world and universe. It is very rare and precise.